Given that the Liaoning was received in a gutted state with only the severely rusted hull, I doubt that it’s flight control can be compared in any manner to the Kuznetsov’s. The flight control of the Liaoning was redesigned at the last shipyard stay. The flight control of 002 was mounted in the new layout from the beginning. Not only did they refit the command facilities on the Liaoning, but there is still zero proof of the earlier one being the same as Kuznetzov’s, and even less proof that the Russians would design their carrier to only have control for like 1/3rd of it’s hangar capacity. Can you show me a designer statement that says it was made to carry 14 aircraft? At least we can say that we both understand that believing that what they show on deck is the total airwing is not based on reality? It was designed to carry more, but it never did. Liaoning will perhaps sometimes in the future carry up to 24 aircraft. Normaly it has 8 on board. And there was an opportunity for a photo shoot, there were 13 on deck. On its Syria campaign in 2016 Kuznetsov had 4 MiG-29 and may be 6 but not more than 8 Su-33 on board. Look, do you honestly believe that Liaoning can carry it’s entire air wing on it’s deck?? Then what is the hangar for? Decoration? The fact it CAN embark 13 J-15s on deck means it’s max capacity is far more. Most CV have larger hangar than deck, even super lowballing and saying the areas on Liaoning’s deck used for parking space is equal to hangar size, that’s a load out of 26, same as the general consensus (even among anti China analysts) is. 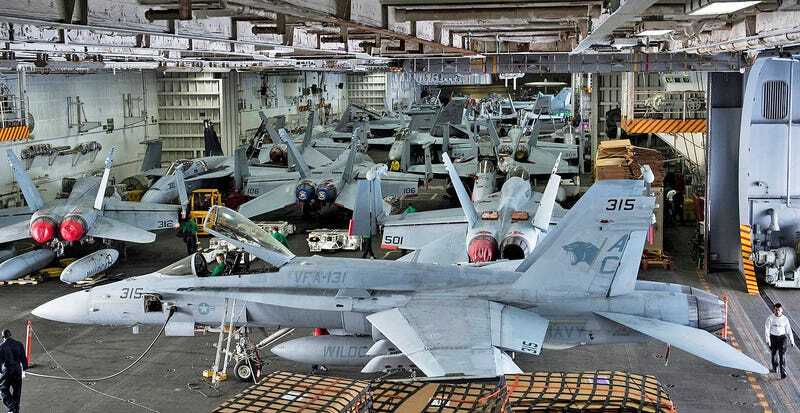 US-Navy-rule is, 40% of aircraft can be put into the hangar. Royal Navy rule is, all aircraft can be stored in the hangar. Brumby and Marjohn like this. Look, do you honestly believe that Liaoning can carry it’s entire air wing on it’s deck? We have watched about six to seven around the island the nose facing to the island and five on the foredeck - the last of them just landed. Then what is the hangar for? Brumby and bd popeye like this. You aren’t answering the questions. What does recovery have to do with the air wing size? This is a Nimitz carrier sporting a full deck, like the Liaoning’s 14 aircraft display. I count just ~30 planes. So I guess 80 planes were just a big conspiracy then?? Or maybe the Nimitz, like the Liaoning, actually has a place below deck where more planes can be put. Like carriers have had since WW2. During the Vietnam war an average US-Navy carrier put on one run into the wind more than 40 aircraft as Alpha-strike into the air, quite half of its air wing. I remember USS Enterprise with 160 sorties in a single day. Layout based on the Kuznetsov’s, i.e. extra space from removing granit missiles not accounted for. The bird’s eye hangar pic is also without planes parked on the deck, which can be up to 14. 14 + however many they can fit in the hangar (22?) would be the absolute max capacity, like 90 is the max capacity for Nimitzes. 14 aircraft as alpha strike seems reasonable for Liaoning, given it has less bow space to park on, uses larger fighters and is about slightly more than half the displacement of a Nimitz that can put up 40 planes. That is a theoretical load of aircraft and nor Kuznetsov neither Liaoning has seen more than 14 aircraft on board yet. Kuznetsov will never see aircraft again and Liaoning may see some day in the future her 24 aircraft. I am waiting for this moment. If you would like to know, how many aircraft are on board an US-Navy carrier, google for pictures of quija-boards. There should be all aircraft on the table: the one on deck, in the hangar and in the air. Because the deck crew have to deal with all of them. They have to clear the deck immediately, if an aircraft in the air has an emergency. So a force of several carriers may have more aircraft an board of each carrier than a single carrier enroute: the aircraft just taken off may land on the other carrier, the carrier with the departure phase can park a lot if aircraft ready for the next sortie on the runway because there is a departure alternate near by. Marjohn, mys_721tx and Brumby like this.